As time went by Victoria started having grandchildren. She dedicated her life to her children and grandchildren! While living in Mexico, Victoria loved to knit and would sell her designs she made to others. She would read the bible often and liked to walk in the spring and summer around town. Victoria always helped people who needed help and went to church often. She was an amazing human being who always was looking out for and wanted the best for her family. She will be deeply missed! 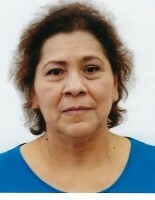 Victoria passed away March 22, 2019 at the age of 61 years. She is survived by her children Oscar Pena, Mayra Pena, Roxanna Pena, Christian Pena and Erika Mejorado of Tecumseh, grandchildren, Jazmin, Jovony and Saul Cabrales, Sofia Rojas, Gustavo, Victoria, Julissa, Maria and Alexa Pinedo and Celeste and Christian Pena. Mass of Christian Burial Service will be held at 10:30 a.m. Wednesday, March 27, 2019 at the St. Andrew Catholic Church in Tecumseh, Nebraska with Father Craig Clinch officiating. Visitation will be 9:00 a.m. to 5:00 p.m. Tuesday, March 26, 2019 at the Wherry Mortuary in Tecumseh, Nebraska. Rosary will be recited at 7:00 p.m. at the church. Interment will be in the St. Andrew Catholic Cemetery, Tecumseh, Nebraska.